If you’ve been living under a rock recently, then I’d like to tell you that TEKKEN TAG TOURNAMENT 2 is out in arcades in Japan & S. Korea! There have been a bunch of videos hitting the net thanks to faithful uploaders. Big thanks go out to everyone that helps push out TEKKEN content to the fans! Here are some of the better sources for TEKKEN videos on YouTube; click the links below! 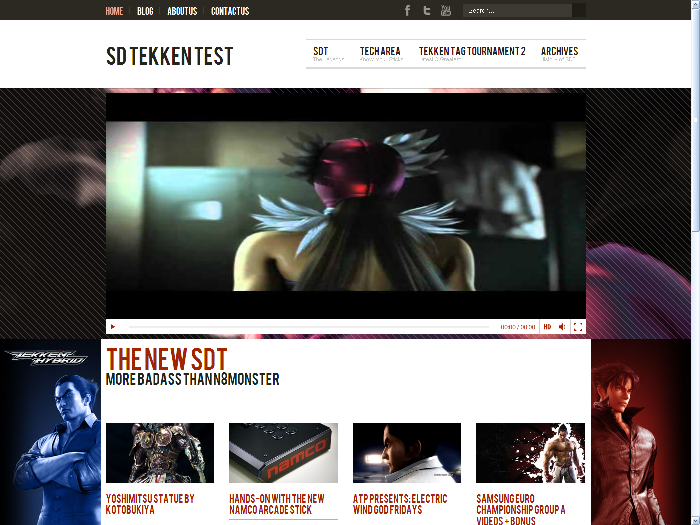 In SDTEKKEN news. I know we’ve been teasing at it for awhile, but a new site redesign (teaser here) is almost 100% complete. The staff here has been working (sometimes frustratingly) in porting over the site to make the complete change. With the change you’ll see a lot more content and a bigger focus on the fighting game community side of things. So expect a lot more coverage on ALL of the fighting games out there… And of course all things TEKKEN <3 ! Curious about the Venezuelan Tekken 6 community who dominated two of this year’s major European tournaments? Why not ask one of its best players, ElNegro, who won a big tournament in Italy earlier this month with Raven? Post your questions in the comments! You are currently browsing the archives for the SD TEKKEN category.